To be held at the offices of EY LLP, 100 Adelaide Street West, 40th floor, Toronto, Ontario, Canada on Wednesday, May 15, 2019 at 10:00 a.m. (Toronto time). 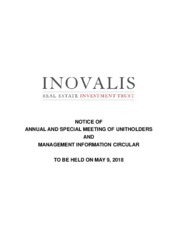 To be held on May 9, 2018 at the offices of Goodmans LLP, 333 Bay Street, 34th floor, Toronto, Ontario, Canada on Wednesday, May 9, 2018 at 11:00 a.m. (Toronto time). 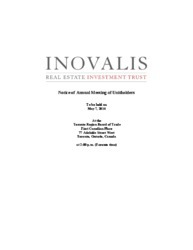 Proxy to be held on Friday, May 13, 2016 at 2:00 p.m. (Toronto time). 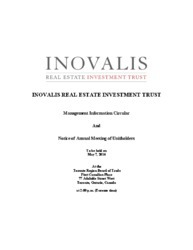 Proxy to be held on Wednesday, May 13, 2015 at 2:00 p.m. (Toronto time). 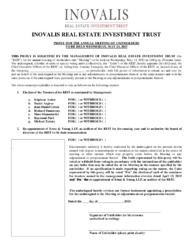 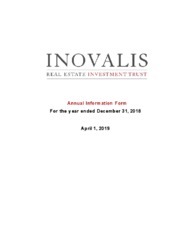 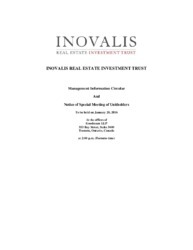 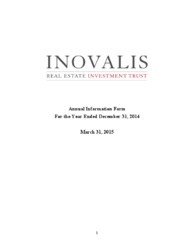 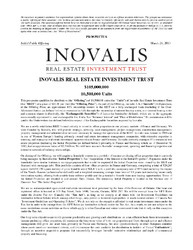 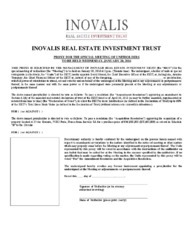 This short form prospectus qualifies the distribution (the “Offering”) of 3,978,500 trust units (the “Offered Units”) of Inovalis Real Estate Investment Trust (the “REIT”) at a price of $9.30 per Offered Unit (the “Offering Price”). 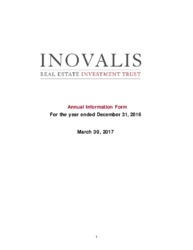 Le présent prospectus simplifié vise le placement (le « placement ») de 3 978 500 parts de fiducie (les « parts offertes ») d’Inovalis Real Estate Investment Trust (la « FPI ») au prix de 9,30 $ la part offerte (le « prix d’offre »). 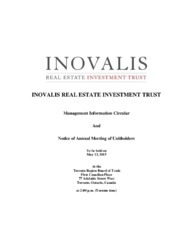 Proxy to be held on Wednesday May 7, 2014 at 2:00 p.m. (Toronto time). 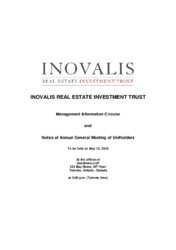 This is an amendment (the “Amendment”) to the notice of meeting (the “Notice of Meeting”) and management information circular (the “Information Circular”) of Inovalis Real Estate Investment Trust (the “REIT”) dated April 2, 2014 for the annual meeting of unitholders of the REIT (the “Meeting”) to be held on Wednesday, May 7, 2014. 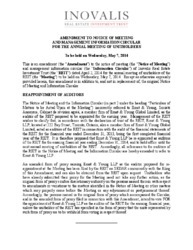 Except as otherwise expressly provided herein, this amendment is in addition to, and not in replacement of, the original Notice of Meeting and Information Circular. 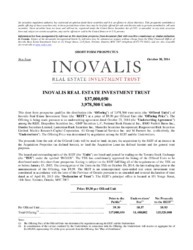 ------------------------------------------------- This prospectus qualifies the distribution (the “Offering”) of 10,500,000 units (the “Units”) of Inovalis Real Estate Investment Trust (the “REIT”) at a price of $10.00 per Unit (the “Offering Price”). 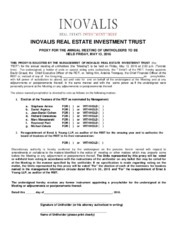 As part of the Offering, Inovalis S.A. (“Inovalis”) will purchase, at the Offering Price, an approximate 10% ownership interest in the REIT on a fully exchanged basis (including if the Over- Allotment Option (as defined below) is exercised in full) through the ownership of interest bearing notes, non-interest bearing notes and common shares (collectively, the “Exchangeable Securities”) of Luxco (as hereinafter defined), which are, in the aggregate, economically equivalent to, and exchangeable for, Units. 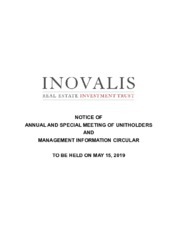 See “Retained Interest” and “Plan of Distribution.” No commission will be paid to the Underwriters (as defined below) in respect of the Exchangeable Securities acquired by Inovalis. 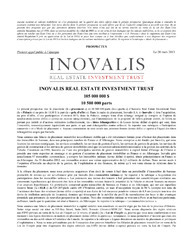 ------------------------------------------------- Le présent prospectus vise le placement (le « placement ») de 10 500 000 parts (les « parts ») d’Inovalis Real Estate Investment Trust (la « Fiducie ») au prix de 10,00 $ la part (le « prix d’offre »). 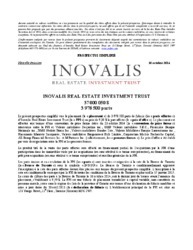 Dans le cadre du placement, Inovalis S.A. (« Inovalis ») fera l’acquisition, au prix d’offre, d’une participation d’environ 10 % dans la Fiducie, compte tenu d’un échange intégral (y compris si l’option de surallocation (terme défini ci-après) est exercée intégralement), par l’intermédiaire de la propriété de billets portant intérêt, de billets ne portant pas intérêt et d’actions ordinaires (collectivement, les « titres échangeables ») de Luxco (terme défini ci-après) qui sont, dans l’ensemble, économiquement équivalents aux parts, et qui sont échangeables contre celles-ci. 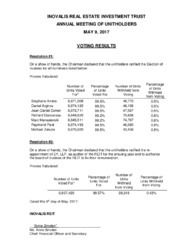 Se reporter aux rubriques « Participation conservée » et « Mode de placement ». 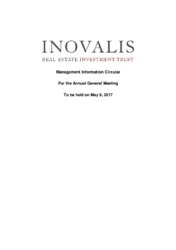 Aucune commission ne sera versée aux preneurs fermes (terme défini ci-après) à l’égard des titres échangeables acquis par Inovalis.